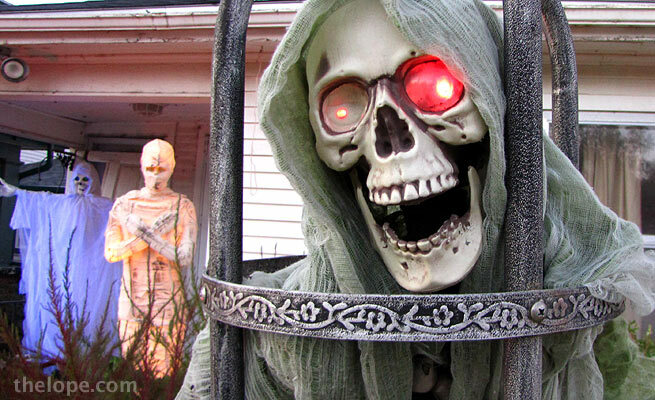 The veil between life and death being at its most thin, our corpse friend's eyes were glowing on Halloween night. Honestly, I didn't know he could do that. 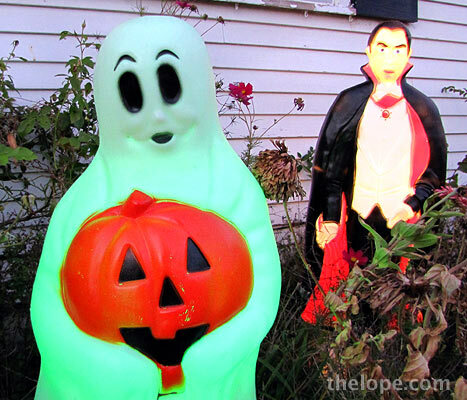 This year as in the past few, I decorated Patsy Terrell's lawn for Halloween. Patsy always invites her friends to help hand out high fructose corn syrup and food coloring to small children and undeading the lawn is my department. 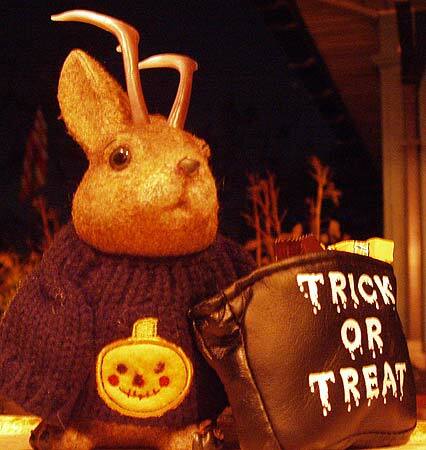 I always enjoy trick or treaters. 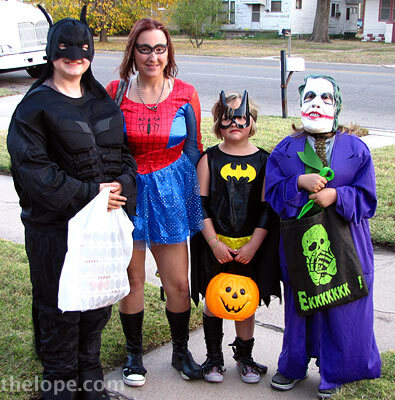 This group obviously sought to illustrate a DC-Marvel crossover. 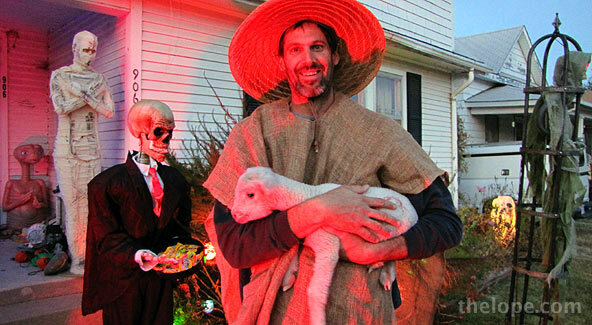 One guest stopped by with a lamb. You don't see that everyday. The talking skeleton butler behind him is a new addition that I bought last year on clearance. This year there's nothing left I'm interested in so I won't be hitting the stores. This year I observed Ace's rule of Swag Karma - as one takes swag at state fairs and such, one should give it on occasions like Halloween. The skeleton butler offered spider rings kaleidoscopes and the timeless plastic vampire fangs. I think I wore a set of those everyday in 6th grade as I perused well-worn issues of Famous Monsters of Filmland. The E.T. on the porch is also new. I forgot to get a good shot of him tonight so there's one from a few months ago below. E.T. 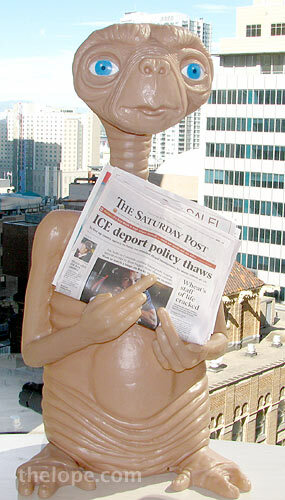 has been eager to be seen ever since the government eased up on illegal aliens back in August. He doesn't fit the whole death theme of the Halloween display, but he was popular tonight. 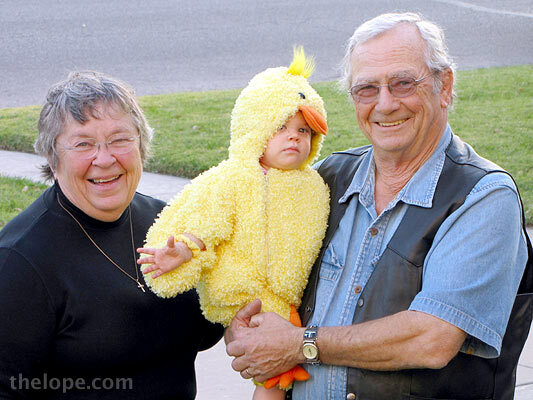 The great-grandparents next door found a duck on their lawn. The blow mold ghost looked friendly - Bela Lugosi, less so. 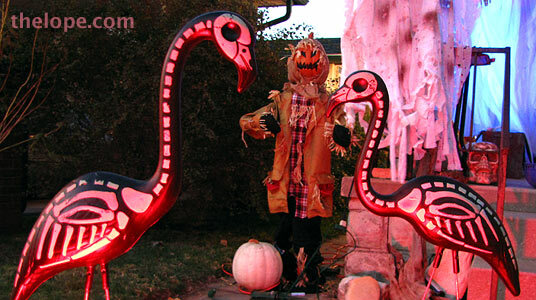 The skeleton flamingos were a hit. 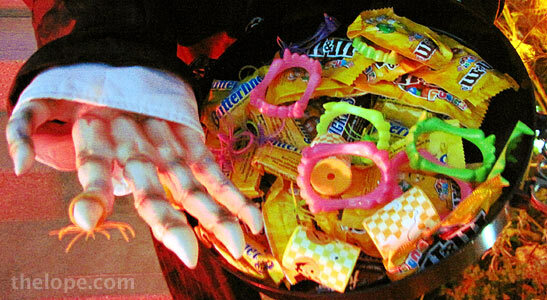 We had about 400 trick or treaters tonight, I'd say - not as many as in previous years but not a bad showing considering some folks took their kids out last night instead because it was Saturday. I simplified the display this year as life is much busier and the toting of things takes time and manpower we didn't have available. 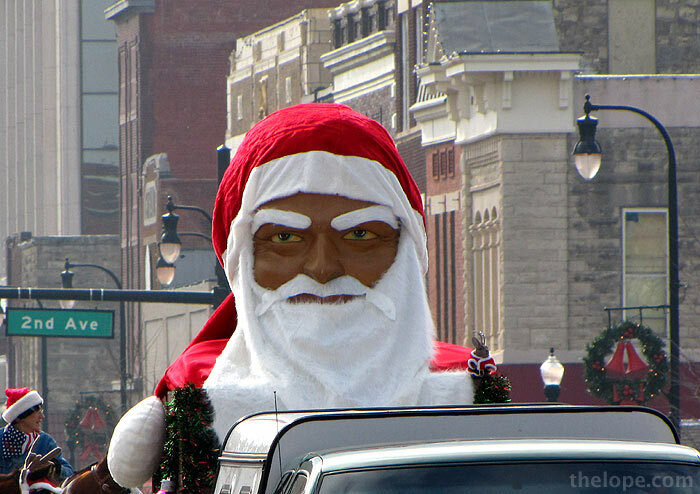 Last year we used a huge "muffler man" head but he's sidelined this year, still made up as Santa from the 2009 Hutchinson Holiday Parade. 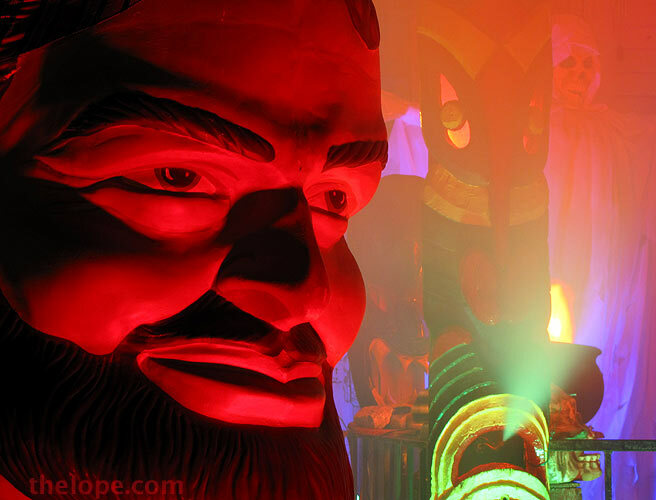 We also declared a hiatus for our fog-spitting tiki mask but he'll probably be back next year. We were missing two usual participants this year. 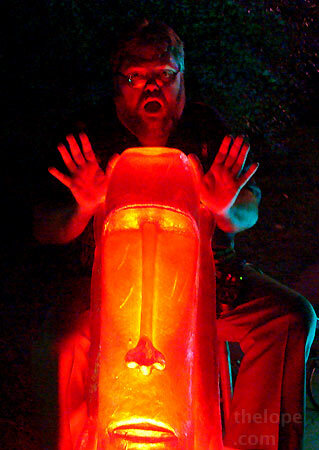 Ace Jackalope (file photo) is on special assignment in Washington DC with Mark Reddig I hope they take lots of pictures.